I will kick this off by saying that this is every bit as delicious and as satisfying as it looks. 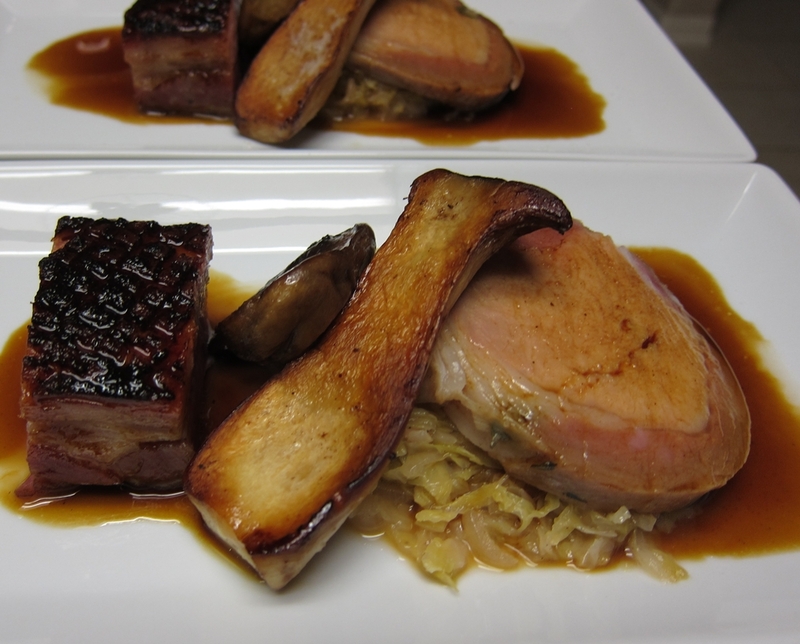 It’s a great comforting combination of a cured piece of pork belly, a perfect impeccably cooked portion of loin, tart cabbage cooked with onions and bacon, seared marinated mushrooms and a rich flavor-packed pork sauce to round it all off. Did I mention that all of this goes with a side casserole of truffle-flavored cheesy macaroni? There is nothing here that does not hit a perfect note. 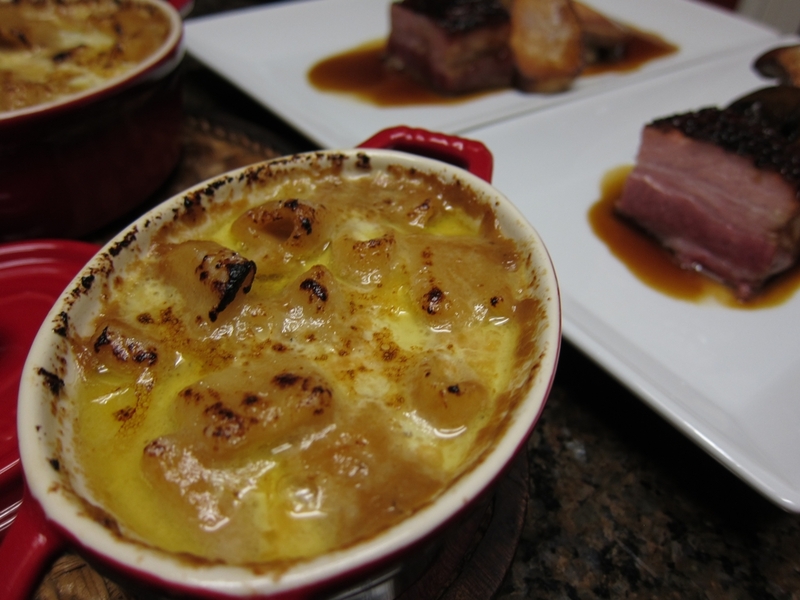 The inspiration of this dish according to the recipe intro is Heston Blumenthal’s love of the cast iron pan called cocotte that he uses to cook meat over an open fire while camping. Now, at a fine dining establishment like the Fat Duck where consistency and efficiency are paramount using a cast iron pan is not the most efficient way of cooking the “Pot-Roasted” loin of pork. The title of the recipe is meant to invoke a nostalgia of the cast iron pot-roasting even though the meat is perfectly cooked sous vide. 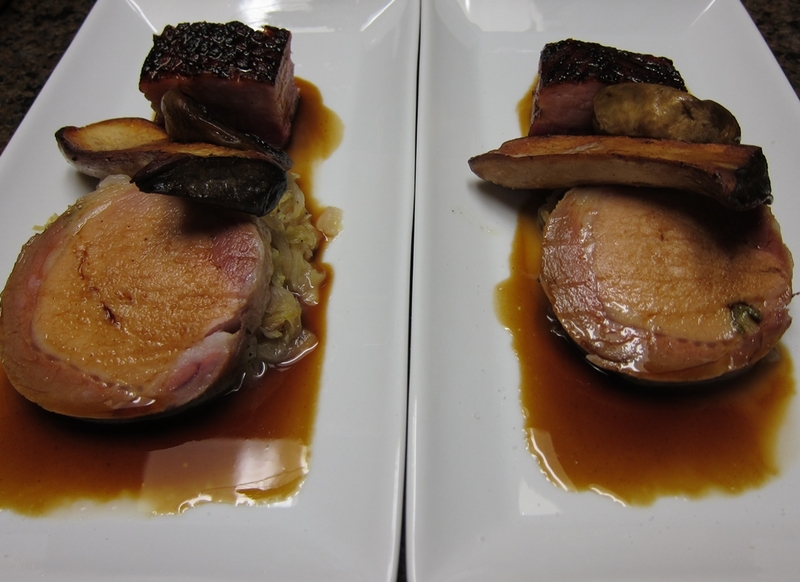 I started working on the dish by preparing the pork belly and the pork sauce. The belly was cured in a brine of salt, nitrite salt, water, lots of herbs, lemons zest, juniper berries, allspice, cloves, coriander and star anise. After sitting in the brine for 48 hours, I soaked the belly in several changes of fresh water. Then I bagged it with some water and cooked it sous vide for 36 hours. After it is cooked and cooled I skinned it and trimmed all but a thin layer of surface fat and divided it into several perfect cubes that got bagged individually in FoodSaver pouches. The pork belly pieces were frozen until service day. 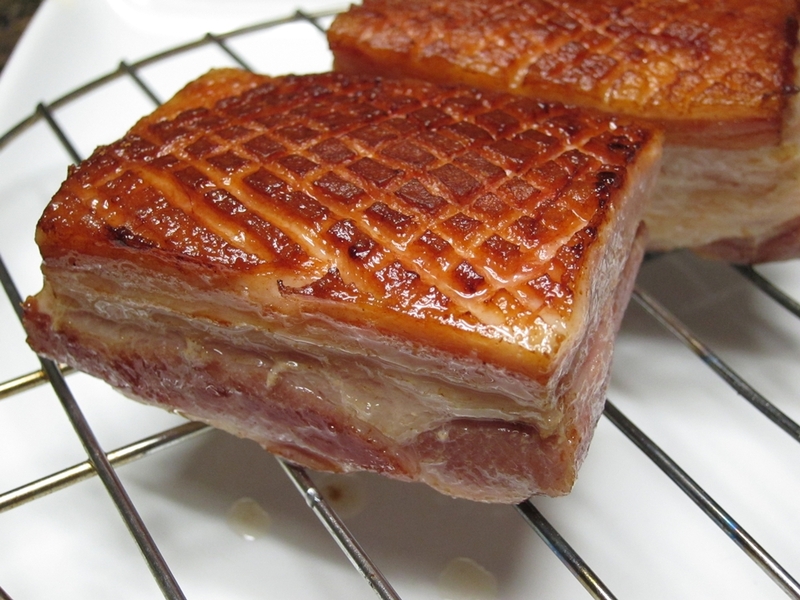 At that time, I warmed up the pouches in water to loosen the pork belly and then removed them from the bags and seared them gently on the fat layer until they got brown and crispy. For the sauce, I sautéed pork bones, pork meat, onions and carrots in a mixture of oil and butter. These then went into a pressure cooker along with chicken stock, water and some herbs and cooked at full pressure for a couple of hours. The stock is then cooled, strained and reduced to a sauce consistency. Right before service, I heated it with a few sage leaves and whisked in a little butter. Preparing the pork loin was a bit similar to the belly process. 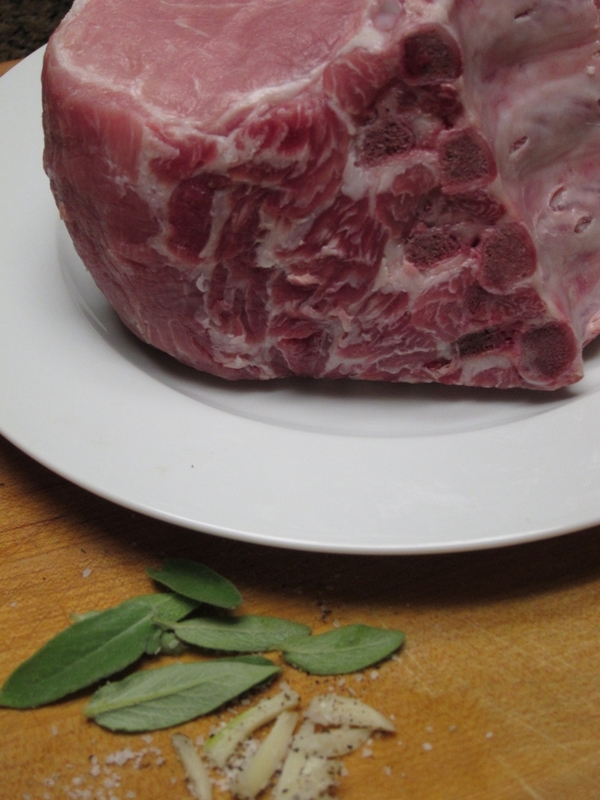 The loin, on the bone, is poked at several places and stuffed with sage and garlic. It is then salted heavily and left to cure with lemon zest and a lot of thyme for 48 hours. Then I washed the salt off and soaked it in a few changes of water. I removed the bone and wrapped the meat into a tight cylinder in plastic wrap. That went into a FoodSaver bag and was cooked at 60 C before serving. 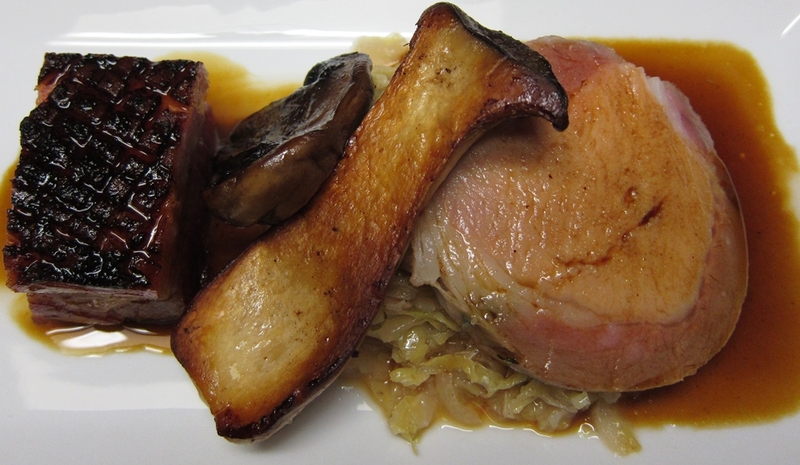 Two other items actually go on the plate with the pork: sautéed cabbage and mushrooms. To make the cabbage, I first made the “Choucroute Onions”. That’s basically a very flavorful mixture of onions, bacon, juniper, allspice, white wine and vinegar. At dinner time, I cooked thinly sliced Savoy cabbage in some butter. When the cabbage was tender, I tossed in the Choucroute Onions. The mixture of cabbage and tart bacon-y onions is delicious. It’s kind of like a mild buttery sauerkraut and is a very good use of cabbage. It’s a classic that goes perfectly well with the rich pork meat. 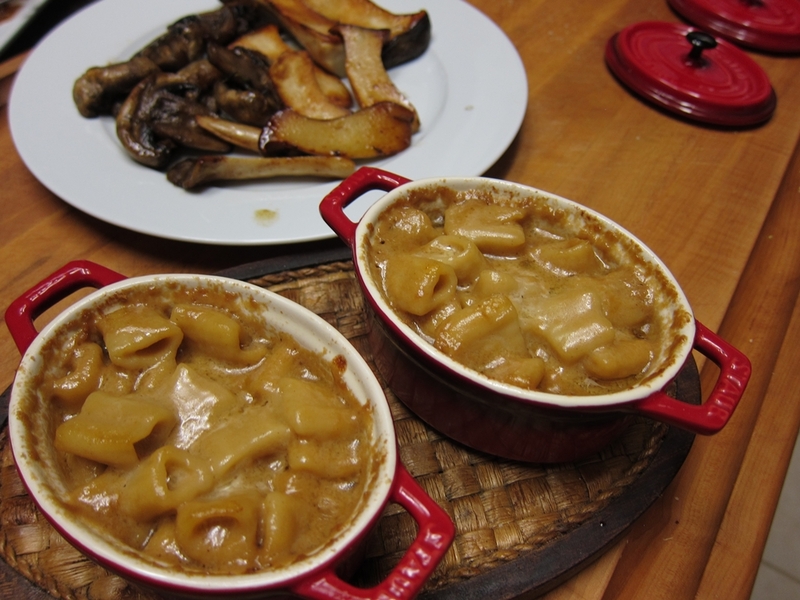 The recipe specifically asks for Porcini (or Cep) mushrooms to serve with the meat. I can never find those tasty but expensive mushrooms fresh anywhere, but I can find them dried and use them all the time. 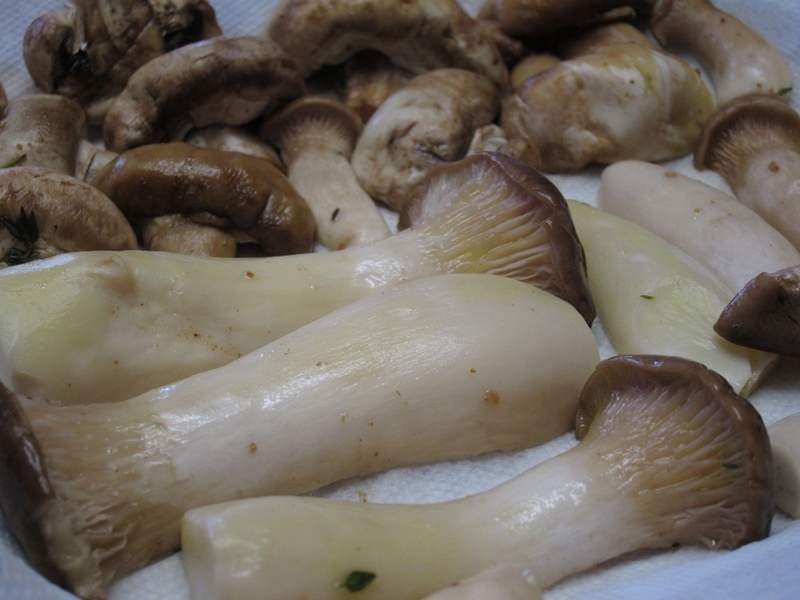 Instead of Porcini, I opted to use king trumpet mushrooms and large white button mushrooms. I marinated those by vacuum packing them with olive oil, thyme and a few pinches of pulverized dried Porcini mushrooms. They marinated for several hours and then I patted them dry and cooked them with butter to a nice golden brown. As opposed to most fine dining recipes where every dish is self-contained typically with all components on one plate or bowl, several recipes in The Fat Duck book include “side dishes”. A lamb dish is served with a sweetbread hot pot, a venison saddle has a beaker of clarified stock with it, sole is served with triple-cooked chips, and this pork dish gets a luscious side of truffled macaroni. Originally, Blumenthal instructs the cook to boil zita macaroni (long tubes) and then cut them into 1 cm cylinders. Instead, I decided to make my own pasta. So, following the Marc Vetri process that I posted about recently, using semolina and water I made the dough and extruded it using the rigatoni plate on the machine. I cut the pasta much shorter than typical rigatoni as it was being extruded to mimic the short zita that the recipe asks for. After the pasta is cooked it gets tossed in a mixture of cream, stock, and Parmesan cheese. The recipe asks for truffle juice to be added in as well, but I skipped that pricey item and seasoned the mixture with excellent Italian white truffle salt. To finish the pasta, I plated it in small individual casseroles and topped it each one with a few tablespoon of an egg and cream mixture. The casseroles then get broiled to brown the surface a bit and are good to go. To plate, I put a small pile of the cabbage and flanked it with both types of meat. A couple of mushrooms go in the center and the sauce is poured gently around and over the meat. We each got a small casserole of the macaroni on the side and enjoyed this complex and tasty plate of food. I cured my own ham to serve for Thanksgiving this year. This was one huge piece of pork from Yonder Way Farm. It was cured for a couple of weeks before being smoked, braised, glazed and baked. The ham made for a fantastic meal or more like ten meals including breakfasts and work lunch sandwiches. After a couple of weeks of that I still had a large ham bone with a good bit of meat stuck on it. What else to do with it other than a rich split pea soup. I remembered that Keller’s Ad Hoc at Home has a recipe for split pea soup so I went to review it and found that, of course, it was not your straightforward typical split pea soup. 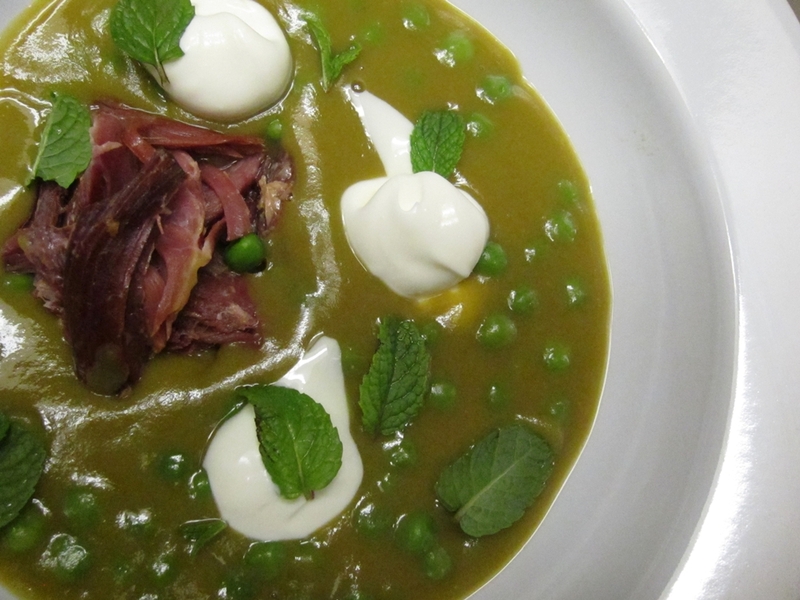 The typical version usually entails boiling a bunch of dried split peas with a ham hock or ham bone and aromatics. 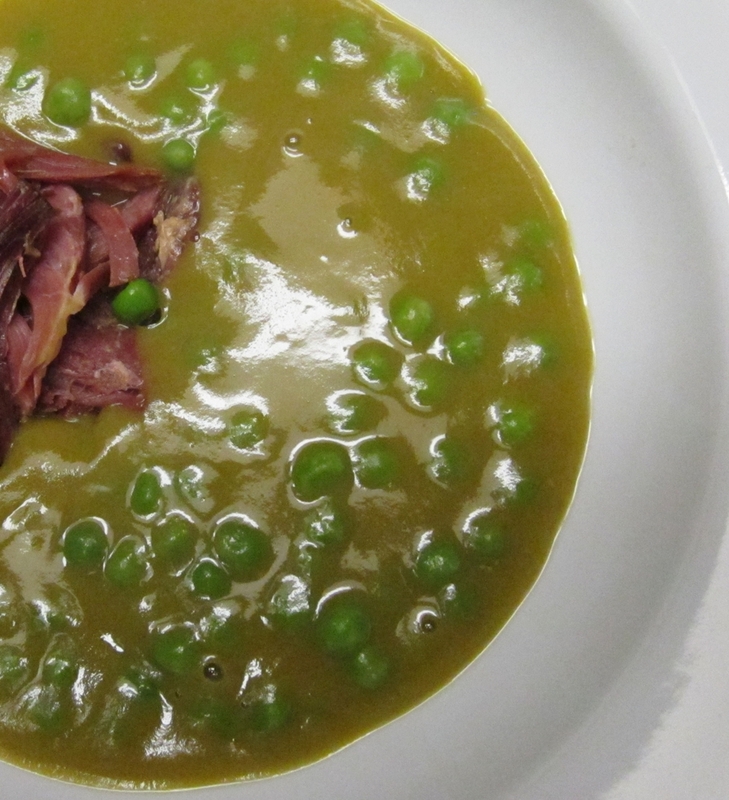 The soup is usually very rustic with chunks of pork from the ham and whole split peas. It’s a tasty warming winter dish. Thomas Keller takes those elements and makes a wonderful version that is at once refined, rich and satisfying on all levels. I stuck fairly close to the recipe, but instead of the ham hock I used the ham bone I had. I used the pressure cooker to make a very tasty ham bone broth with onions, leeks and carrots. Then I simmered split peas in the strained broth until they were soft and almost falling apart. Now, instead of leaving the peas whole Keller has you pureeing the whole thing to make a perfectly smooth soup that has a creamy mouthfeel but has no cream. To finish, I blanched a bunch of frozen green peas in boiling water until barely done and still retained their freshness. Half of these went into the pureed soup. In each bowl I put some of the remaining green peas and some shredded reserved meat from the ham (I reserved the meat before I used the bone for stock). Then I poured in the soup and garnished it with mint leaves and a few dollops of creme fraiche. It was amazing, comfort food at its best and a great example of a split pea soup. 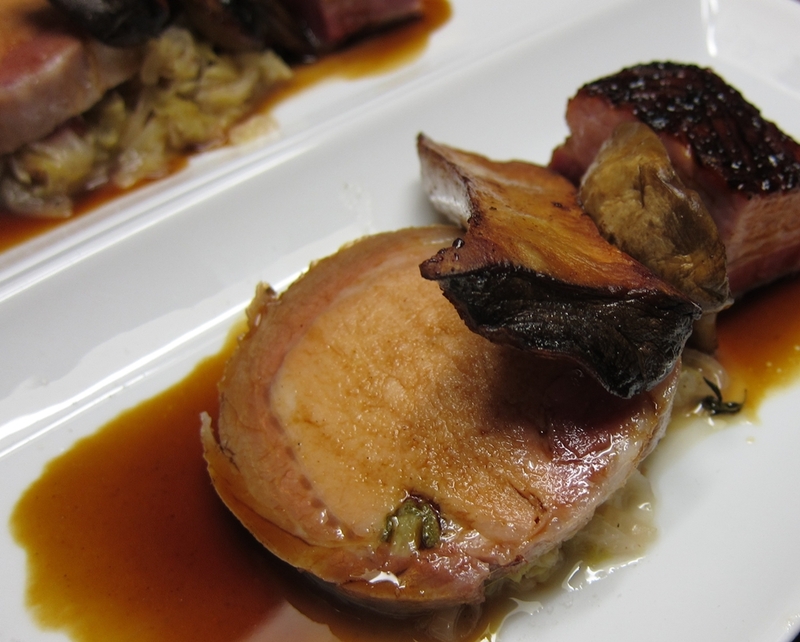 Keller often talks about “finesse” and refinement, the details that make a good dish great. 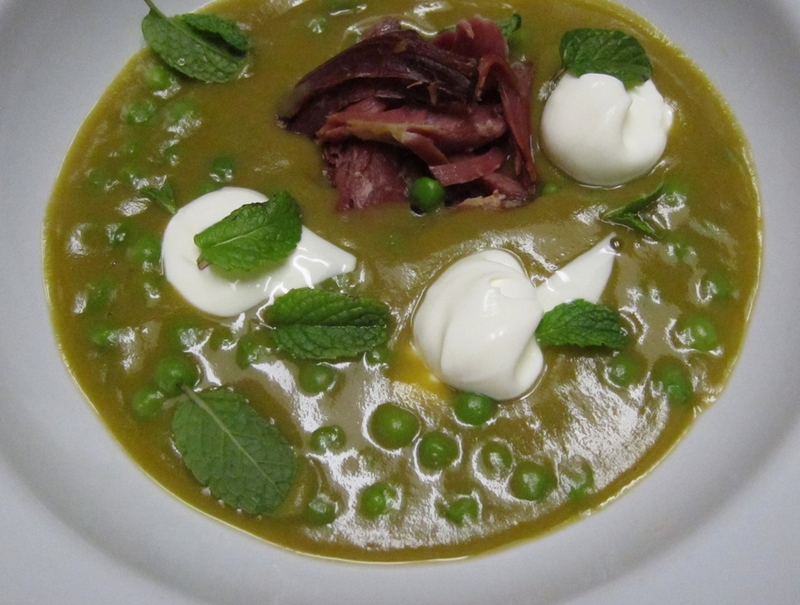 In this case it’s not just pureeing the soup, but the addition of those fresh green peas and mint leaves. They add so much pop and freshness to a bowl of soup that could be otherwise a bit monotonous. Of course that meant I probably ate way more of it that I should’ve.